Dumbo has been dancing the Cha–Cha with Horton in the middle of this Internet room this past month. We need to acknowledge that it’s been a bit rough for all of us in this community. An award we at Uncanny care deeply about has been tossed into chaos for sketchy, ridiculous reasons, complete with implausible conspiracy theories. We expect you know what we’re writing about, or you can figure it out in a few minutes on Google. Apparently, our previous work being nominated for and winning certain awards over the past few years is evidence of science fiction and fantasy going horribly wrong. Rather than engaging with the assholes who’ve created this mess, we think it’s time to restate our principles here at Uncanny Magazine. We believe in an SF/F community where art, love, community, joy, intelligence, and points of view from every conceivable background across the planet are truly welcome. We strive to bring you a magazine and podcast that push boundaries, and make you think and feel. (They need not be mutually exclusive.) We’ve gathered some tremendously creative people, listed on our Authors page and Staff page. We’re proud to have worked with all of them. Your support has made it possible for us to pay them a decent rate for their work. We hope you’ve enjoyed it, because we believe it’s among the best work we’ve ever edited. The Space Unicorn Ranger Corps builds awesome things… together. Space Unicorns are creative, kind, and inclusive. Space Unicorns try new things and share their enthusiasms with the world. Space Unicorns make art, community, and fun together—as creators, readers, and listeners. If being enthusiastic, creating a truly welcoming community, and having an awesome time bringing excellent new SF/F from across the planet to our readers is wrong, we are just fine over here in the wrong–verse. It has pretty awesome parties. Want to help us throw more of them? WE’RE RECRUITING NEW MEMBERS TO THE SPACE UNICORN RANGER CORPS! As you know from last month, Uncanny Magazine is working towards sustainability and funding so that we can begin purchasing submissions for Year Two. We need YOUR HELP to SPREAD THE WORD! 1. There is a Subscription Drive going on at Weightless Books for a year’s worth of Uncanny Magazine eBooks! The drive will run from May 5th—May 19th. For that limited time, you can receive a year’s worth of Uncanny for $2 off the regular price! We will have some nifty giveaways for a few lucky new subscribers at particular milestones, too. 2. On May 28th, we will be opening the Uncanny Magazine Patreon! Do you love our magazine and podcast and want to see them continue, but aren’t interested in an eBook subscription? This is an excellent way to support our magazine. If just 10 percent of our online readers purchase subscriptions or back us on Patreon, we could immediately fund Year Two. And now, onto our current installment! 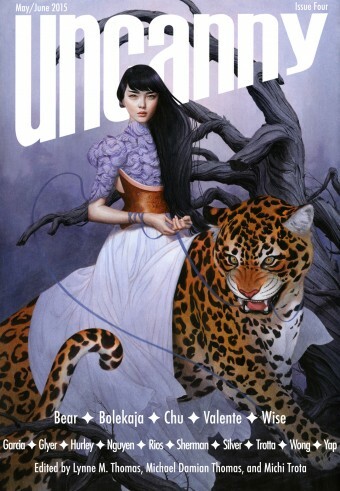 Issue 4 of Uncanny Magazine has a breathtaking cover from Tran Nguyen, Traveling to a Distant Day, and features Catherynne M. Valente’s intense tale of psychic alien cats, “Planet Lion,” A.C. Wise’s whimsically useful “The Practical Witch’s Guide to Acquiring Real Estate,” John Chu’s heart–wrenching tale of knowledge, family, and culture “Restore the Heart into Love,” Elizabeth Bear’s charming library quest “In Libres,” and Lisa Bolekaja’s powerful musical story “Three Voices.” This issue also features Delia Sherman’s classic story “Young Woman in a Garden,” also the title of her recent short story collection from Small Beer Press. Issue 4 also includes essays about the Hugo Awards by Mike Glyer, young adult fiction by Julia Rios, writing versus storytelling by Kameron Hurley, and remembrances of the late and greatly missed Peggy Rae Sapienza by Christopher J Garcia and Steven H Silver, as well as poetry by Alyssa Wong, Ali Trotta, and Isabel Yap, and Deborah Stanish interviewing John Chu and Delia Sherman. Podcast 4A (released on May 5) features Heath Miller reading Catherynne M. Valente’s “Planet Lion,” Amal El–Mohtar reading Alyssa Wong’s poem “For the Gardener’s Daughter,” and Deborah Stanish interviewing Catherynne M. Valente. Podcast 4B (released on June 2) features Elizabeth Bear’s “In Libres” as read by C.S.E. Cooney, Isabel Yap’s poem “Apologies for breaking the glass slipper” as read by Amal El–Mohtar, and additional interviews by Deborah Stanish and Michi Trota. If you love reading Uncanny as much as we love producing it, please continue spreading the word with your comments, tweets, posts, and messages. Share us with your friends! There will always be room for more members of the Space Unicorn Ranger Corps!